Although you won't be ejected from the average Japanese restaurant for mistreating your fish, knowing how to eat sushi the right way enhances the experience and even turns the meal into a cultural lesson. Sushi isn't a cheap hobby, so why not have fun and learn something cultural along the way? Look up the excellent documentary Jiro Dreams of Sushi and you may find yourself in a raw-fish frenzy. Serious sushi chefs study for decades to master making those tasty bites. Applying some basic sushi etiquette and appreciating their creations the proper way shows respect to generations of effort. What was once considered fast food has evolved into a culinary art. Besides, sushi masters are passionate and possess a lot of sharp knives: better to stay on their good side. Disclaimer: The following tips are applicable only for a real sushi experience in an authentic Japanese restaurant, not in any eatery that lists hamburgers and pizza elsewhere on the menu. First, sitting at the counter is to the place to be if you want to take the experience seriously. Go front and center. You should address your sushi chef only when necessary, but ask immediately what he recommends. He most likely handpicked fish from the market, knows what looked good that day, and will reward your trust in him with extra special care. Just snatching a menu and choosing randomly shows that you aren't interested in his opinion. Even if you don't go with his suggestion, your interest in what's going on behind the scenes will be appreciated. That being said, never distract the chef later with questions or small talk pertaining to the food, weather, or Japanese customs. The man is an artist, and he wields a sharp knife—let him work! If the meal turns out to be an unforgettable experience, you can even offer to buy the chef a shot of sake. If he accepts, you should have one with him. Never attempt to hand money—even a tip—to the chef; they work with raw fish all day and should never touch money. Besides, tipping is rare in Japanese custom and needs to be done carefully. Tip: The correct (Japanese) way to pronounce sake is not "sah-key," it's "sah-keh." At formal sushi restaurants, you may be directed to speak with a concierge before the session begins. This ensures that in case the chef doesn't speak English, you get an opportunity to tell about selections you wish to avoid or any allergies. Ideally, your requests will be passed on to the chef to avoid any potential loss of face for either party. The wet towel is for cleaning your hands before you eat, mostly because the traditional way to eat maki and nigiri sushi is with the fingers. Use the towel to clean your fingers, then put it aside; don't use it on your face to freshen up! 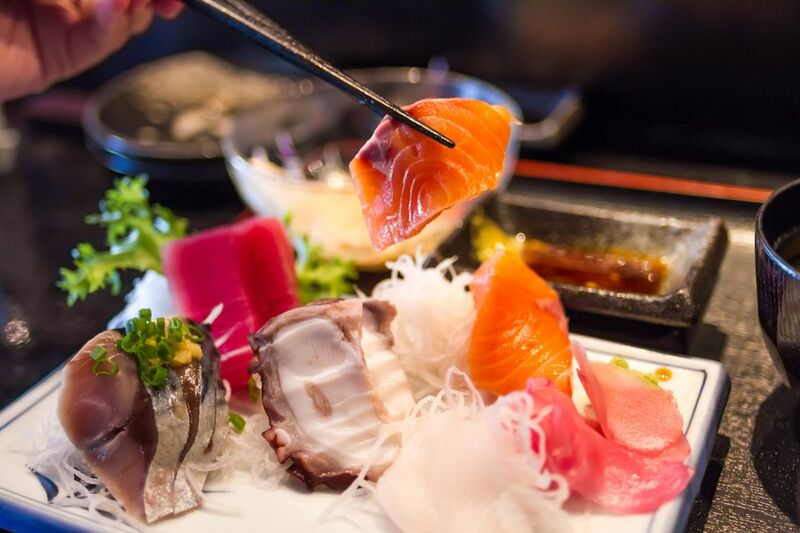 Follow basic etiquette for how to use chopsticks politely when eating sashimi—slices of raw fish with no rice. Pour only a minuscule amount of soy sauce into the bowl; you can always add more later if needed. Wasting soy sauce is taboo in serious Japanese dining etiquette. Also, pouring out too much signifies that you suspect fish is old and needs a lot of "doctoring" before you even try it. Tip: Don't add wasabi to your little bowl of soy sauce! Although this is a common practice, dipping your sushi into this muck is not the best way to enjoy it. When not eating, your chopsticks should be put on the holder beside your plate, tidy and parallel to the table, rather than on the plate or your dipping bowl. Leaving your chopsticks anywhere else may indicate that you are finished eating! Sitting your chopsticks down between pieces of sushi is polite and acceptable. Believe it or not, no matter how much you enjoy the burn, turning your soy sauce into a cloudy mess by mixing in wasabi is not the proper way to eat sushi. The chef will have already added small amounts of wasabi to each piece, based on the type of fish, to bring out flavors. Japanese restaurants do provide additional wasabi to accommodate people with spicy interests, however, adding too much wasabi in front of the chef not only hides the natural taste of the fish he painstakingly handpicked; it's akin to dumping ketchup all over a perfect cut of beef in an expensive steakhouse! If you need to add wasabi, brush some onto the fish with either your chopstick or a piece of ginger. Don't leave the ginger on top of the sushi as an enhancement! Sucking the extra wasabi off of your chopsticks is also considered bad form. Fresh ginger is provided to cleanse your palate between bites and should never be eaten at the same time with a piece of sushi. You can always ask for additional ginger should you need it. Fortunately, there are no pretentious guidelines as to which type of sushi you should eat first, and no order follows. The chef may have his own plan for which pieces should come in which order. If you particularly enjoy something the chef made, tell him, and ask for another piece. Sashimi is typically eaten with chopsticks, but the traditional way to eat sushi is by lifting a piece between your thumb and middle finger. Picking up the sushi with the fingers allows you to feel the texture and helps to keep it together, rather than damaging it with wooden sticks. Regardless, you'll be forgiven for using chopsticks. Again, the only time that mixing wasabi into your soy sauce is acceptable is when you will be eating sashimi. Turn the piece upside down by rotating it counterclockwise, then dip only the fish into your soy sauce—never the rice. Not only will the rice absorb too much soy sauce and change the texture of the bite, leaving rice behind in your bowl is amateur. Preparing the vinegared rice properly is also part of the sushi art. Sushi pieces such as unagi (eel) and those with sauce already on top should not be dipped. To be a real sushi pro, pieces should be placed in the mouth upside down so that the fish is against your tongue. Allow your tongue to take in the complex flavors before gulping down the bite. No matter the size, you'll ideally be able to eat the entire piece in one bite. Trying to make a piece into two bites usually results in it falling apart. The last and single most important rule of how to eat sushi properly is that you enjoy every single bite—more than likely it will be the bill and not the wasabi that causes a little heartburn later! Exiting tip: Remember to give a deep, respectful bow to the chef as you leave the establishment.